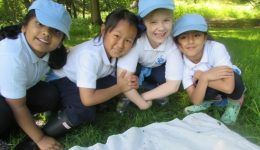 Braeside School has around 70 full time and part time teachers, assistants, specialists and support staff who work together for the benefit of the children. As one of the Oak-Tree Group of Schools, much of the day-to-day behind the scenes administration such as finance, operations, personnel, maintenance, IT support and marketing is centralised by Head Office. With over 300 staff spread across the four schools, The Oak-Tree Group of Schools has a professional approach to the selection and on-going training of staff. We only employ staff of the highest calibre who share our vision and ethos.